Notary Express commenced with one individual in 2013 and has grown significantly over the years to a current team of 16. We provide a full range of non-contentious legal services, including notarial services in Norwich and Camden, and we specialise in conveyancing. Due to our unique setup we have had many lawyers join us who have childcare responsibilities or family life outside of work, because our system allows them to balance their working and family lives. We are also commission-driven so hard work is outstandingly rewarded. At Notary Express we put our team members and our clients at the heart of the matter. We are proud to be recognised with the above award by SME News. Each year Notary Express participates in Free Wills Month October. Last year our participation in that and Will Aid equated to over £340,000 raised for the participating charities. We also provide free wills throughout the year to those who obtain a form through the Free Wills Network. At Notary Express we are always trying to do what we can to support the community. We are very pleased to confirm that we have now joined Hanley Building Society’s conveyancer panel. This means that we can represent Hanley Building Society as well when you are purchasing with a mortgage from them. This saves you money because we do not charge for representing the lender or any other hidden costs. This is more excellent news for Notary Express and our clients. Thanks to ongoing support by our wonderful clients, Notary Express has been steadily growing in size. 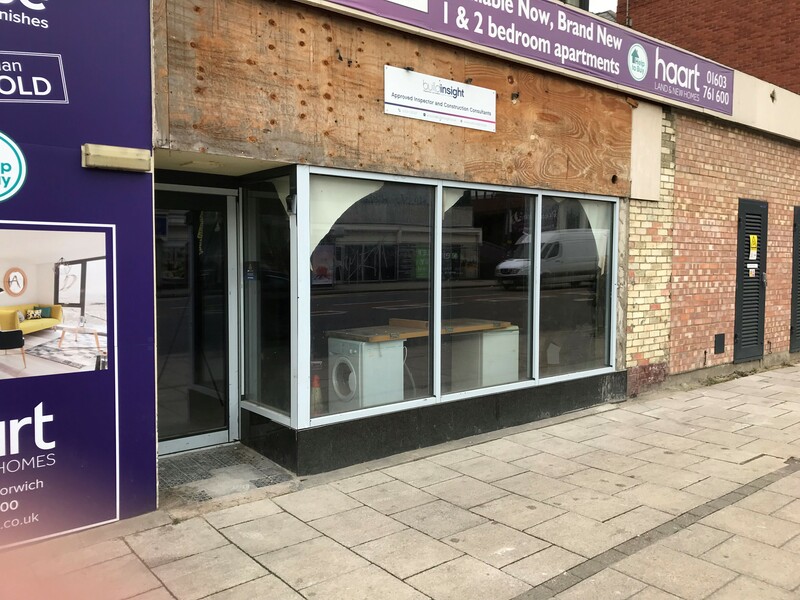 We have reached the limit for housing members of the Notary Express team at our current office and have finally been able to buy our own building. As you can see, it’s going to need a little work to get it into shape! We found no electricity or water when we moved in but decided against going old-school with candles and a bucket. Drilling through a ceiling and hoping we didn’t come up into someone’s flat was exciting. And we also found time to donate a washing machine that had been left there to some random stranger who popped in to ask for it. 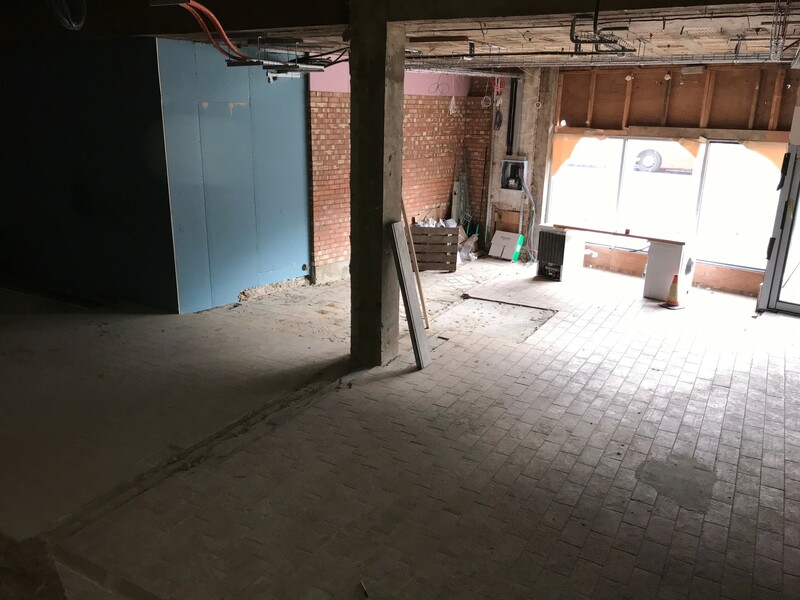 Work is well underway now for the renovation and the photos shown illustrate where we’re up to, with the rubbish stripped out ready for the new installations to go in. 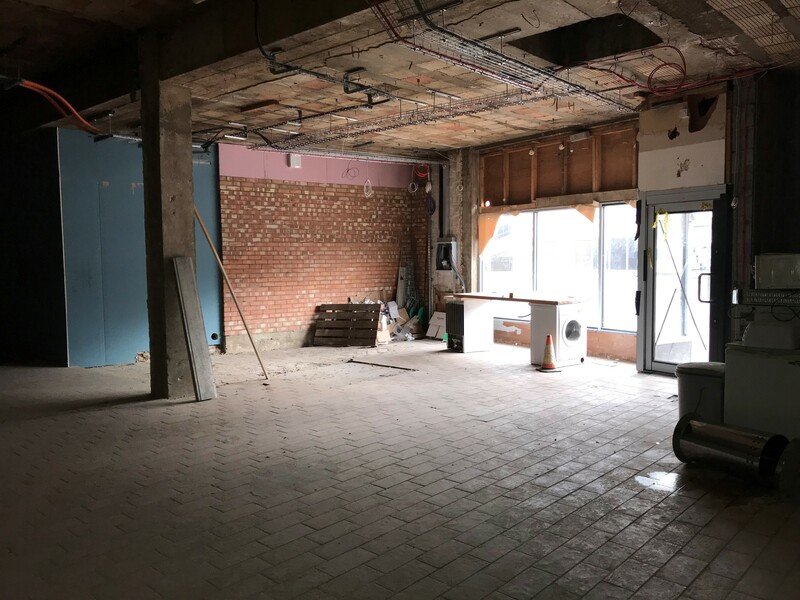 We have a great team on hand including electricians from Stanton & Stubbs (www.stantonandstubbs.co.uk), plumber William Napthen (07557024628), data from Anglian Internet (www.anglianinternet.co.uk) and a fantastic builder (Homespaces77). Please contact us if you need referrals for any tradesmen or professionals – whatever the job is, we probably know someone who can help. 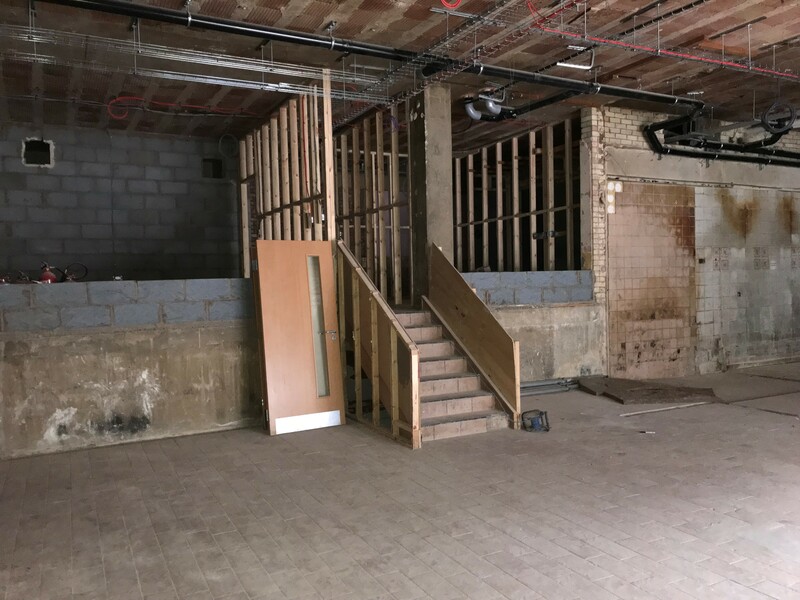 We’re all looking forward to seeing the new office once the project has been completed. Would you like £100? Do you know anyone moving house? This month we are offering £100 for each referral for someone buying or selling a property which turns into a paid instruction for us. All you need to do is recommend our conveyancing services to someone. If they proceed to instruct us this month then on receipt of our fees from them we will send you £100 instantly. No prize draw, it's £100 every time you refer someone this month and they use us. Just make sure they tell us that you referred them! 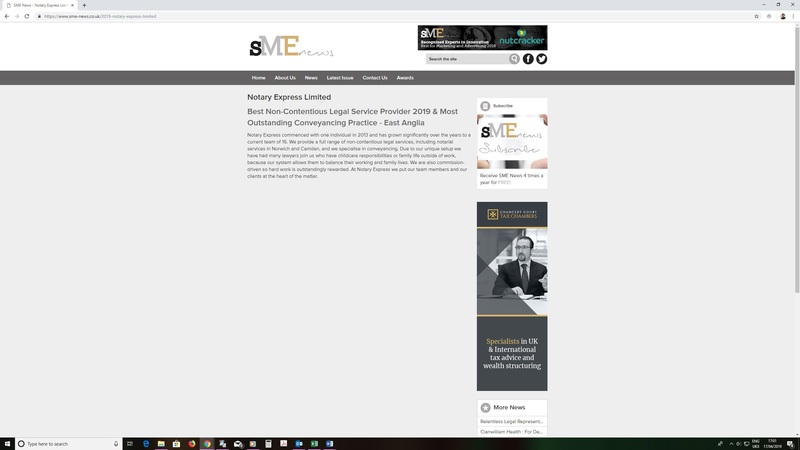 We are delighted to announce that Notary Express has been awarded Most Outstanding Conveyancing Practice of 2018 & Best Non-Contentious Legal Service Provider 2019 in the SME News 2019 Legal Awards. Congratulations to our great legal team for their outstanding expertise and ability to deliver and exceed client expectations. 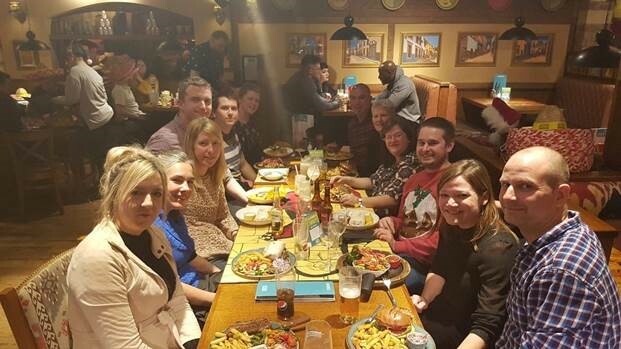 The Notary Express team enjoying a wonderful evening at our Christmas party. Lovely food, funny hats and some great fun was had by all. It’s great to see how the team at Notary Express have grown from 1 person to so many (and there are more who could not make it) in 6 short years. We have come a long way and thanks to all of our wonderful clients we look forward to continuing to grow the team and continue to provide the best possible customer service. We are delighted to welcome Craig Perry to Notary Express; he will join our Admin team and that will facilitate with the scanning and filing as well as general administrative duties. This helps keep our growing workforce working efficiently and swiftly. We are very pleased to be supporting the government apprenticeship scheme. Notary Express joins Lloyds Group panel. A Lasting Power of Attorney (LPA) permits someone you trust, such as your spouse or other family member, to act on your behalf if you are not able to. There are two types of LPA - one covering your property and finances, and another covering your health and welfare. LPAs can be expensive, at £250+VAT each and a court registration fee of up to £82, and we're actually a lot cheaper than many of our competitors. This month we are going even further with a Buy One Get One Free offer. So you can have both types of LPA done, or you and your partner can both have an LPA for the price of one. An LPA lasts for life so if you have it done now, while there is an offer on, you won't have to pay for it in later years. Choose who you would like to handle your affairs if you lose capacity and contact us to draw up your LPAs today. Offer runs until the end of the month only.